So, I'm gonna show/talk about some of the previous items that are still on the menus as well as chat about the new things that I am excited about! Now I've tried pretty much everything that isn't new, except for a few seafood items and I don't have pictures of it all, or I lost the pictures..my luck. Ha! 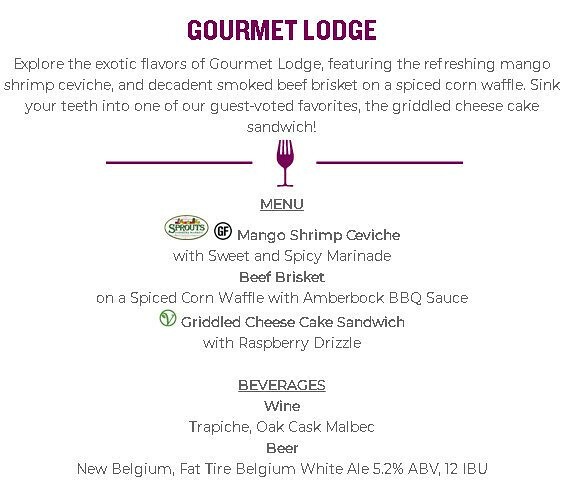 So, from the Gourmet Lodge, you can tell nothing is new. The Mango Shrimp Ceviche is sponsored by Sprouts, but that is about it. I have no eaten it, so I honestly can't attest to its taste. Now the Griddled Cheese Cake Sandwich, I have had and don't have a picture of. However, I will tell you exactly what it is...it is TWO pieces of Pound Cake with Cheese Cake filling smeared on the inside of it, and it is grilled. It's honestly pretty sweet. This is the beef brisket over the spice corn waffle. I don't remember at all what the waffle tasted like..it wasn't memorable. The Brisket..was the basic brisket of the park. I honestly don't even remember what the BBQ sauce tasted like either. If you're a brisket person, I say give this a try, but I think this year, I will be skipping this Cabin. Ahh The Coast-To-Coast Cookery. 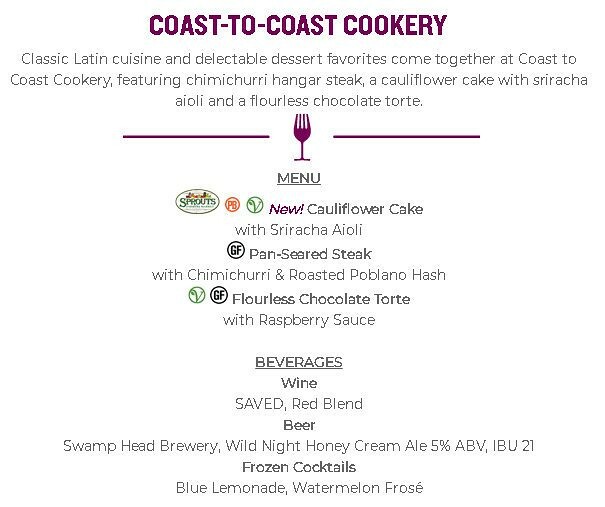 I'm excited to try the Cauliflower Cake, but I am curious if it's supposed to be a sweet thing.. that's really the only thing that concerns me. I've tried both of the other items on the menu. The Flourless Chocolate Torte is very dense and thick, so I say make sure you have a drink when you eat this! It is very good though! The Pan-Seared steak they called "Pan-Seared Hanger Steak" last year..so I am curious if it is going to be the same cut of steak or not. This was quite delicious and is something I definitely would have again! 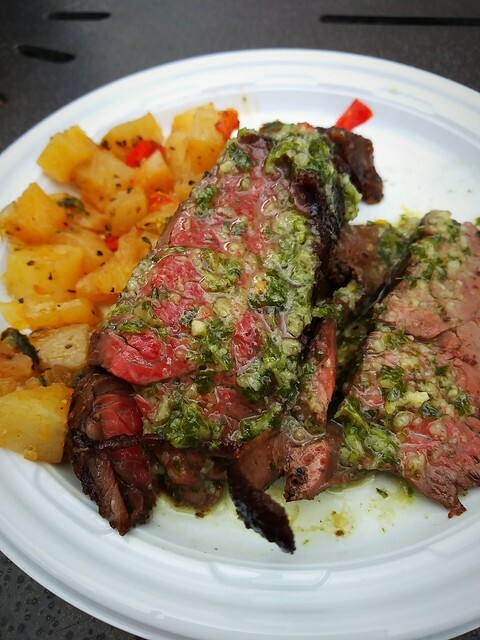 You can tell some of the steak is cooked more than the other parts, but for me personally, I was okay with that..I like my steak rare to medium rare depending on my Mood. Ahh Good ol' Chef's Plantation. The new dish this year is Short Rib & Brie Grilled Cheese...I'm not the biggest fan of Brie cheese, but it's cheese...so I am going to try it! 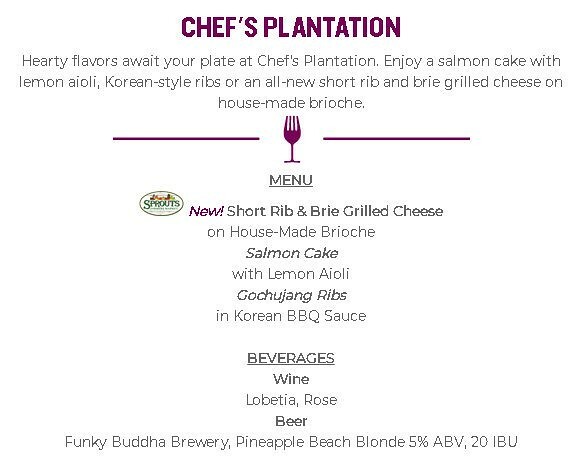 The Salmon Cake they had last year same with the Gochujang Ribs..I think it was actually the same cabin now that I think about it.. o.O I've had the Gochujang ribs and can I just say... Busch Gardens come on...that is NOT gochujang at all. Gochujang is supposed to be spicy..not sweet. So, I was a little disappointed taste wise, but I did get them a couple of times, so they are worth trying! I do remember the Salmon Cake being pretty popular last year as well. 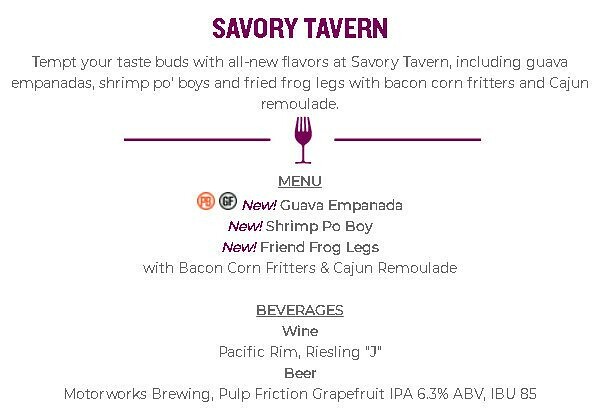 I also have to say that I am hoping they fix the spelling error here kinda quick from Friend to Fried for the frogs legs. 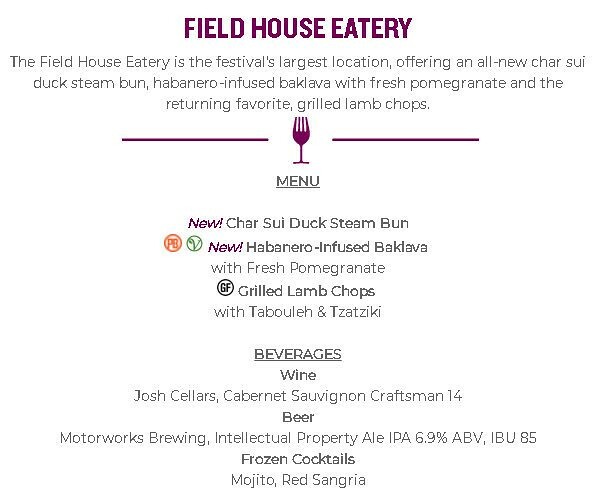 First off, I have to point this out..it is spelled Char SIU ... not Sui...another spelling thing I hope they fix before they mass print the menus. 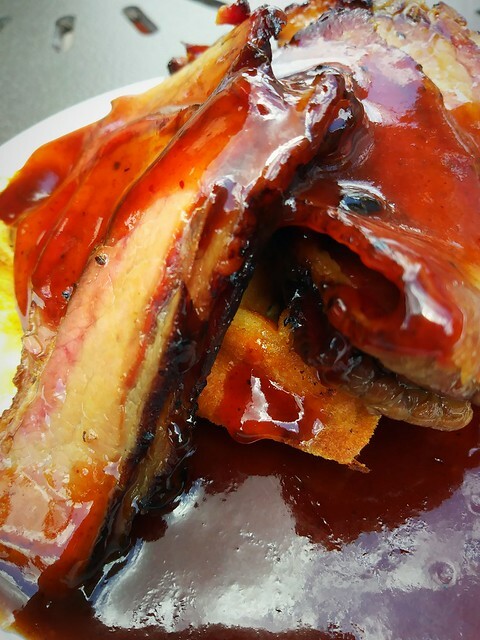 If you don't know what Char Siu is, it is the fatty meat that they add to Ramen. I'm hoping that it is actually spice well and taste delicious..I have high hopes for this. Habanero Infused Baklava? Busch Gardens you have my curiosity peaked...I'm curious as to how a sweet dessert is going to come across spicy. Sounds interesting. Now the Grilled Lamb Chops...there is always a quality control issue with these. 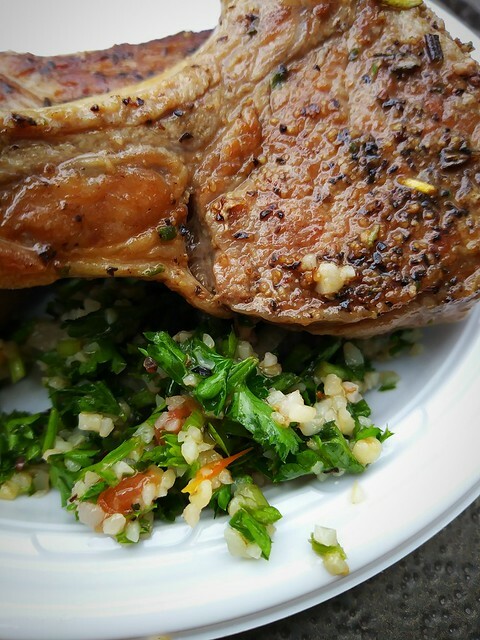 Sometimes you have some really gorgeous chops and sometimes you get a chop that barely has any meat on the bone...I've had both happen to me. All of that aside..these always taste absolutely amazing! You know I am definitely getting them again this year! This is the rare one where I have pictures of all of the dishes. I think this year with the Venison Meatloaf..the only difference is the demi-glace. Last year I think it was just a BBQ sauce. This was actually quite good. 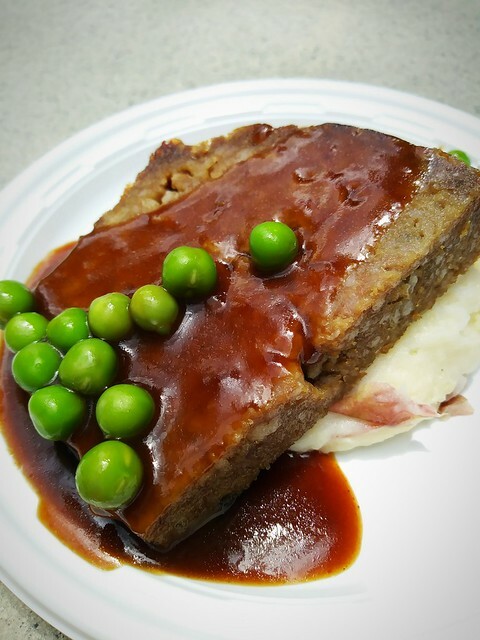 It was a dense meatloaf, but the flavor was amazing. The mashed potatoes were top notch as well. 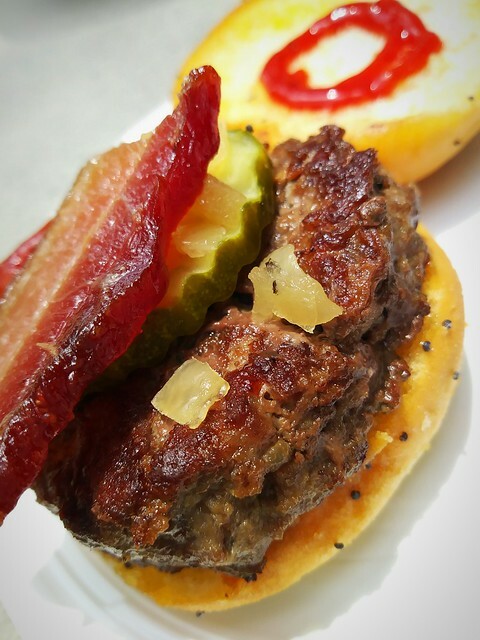 The Bison Slider is so good. I love the Sriracha ketchup that is on it as well. This is so full of flavor. Don't disappoint me this year! Holy sweet baby jesus, the bananas foster panacotta! This bad boy was amazing. 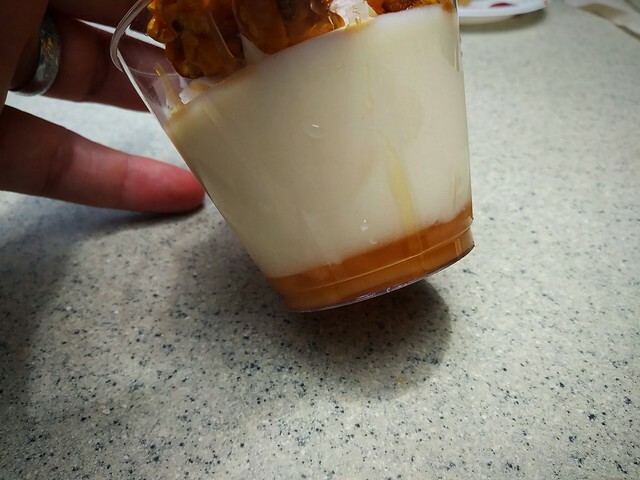 The Popcorn ontop was kind of pointless, but gave a nice stale crunch to give a different kind of texture...so I guess it wasn't pointless. Regardless though, this is something I definitely suggest trying! It was quite good last year. 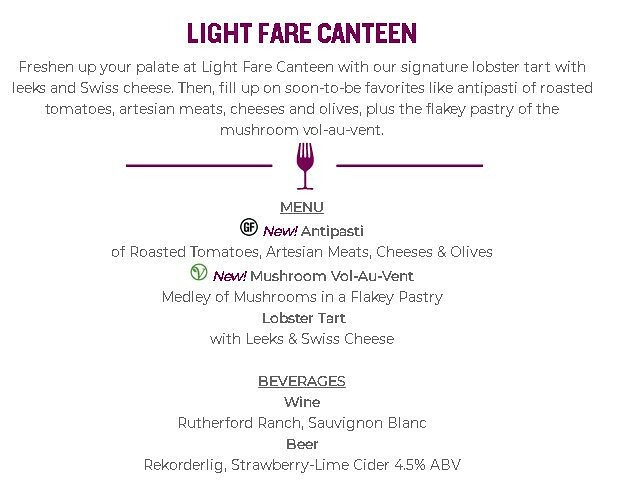 I'm curious if they are going to execute the Vol-Au-Vent correctly or not. The Antipasti also sounds quite interesting...I don't eat olives or tomatoes.. so I would be sharing it with someone if I get it! 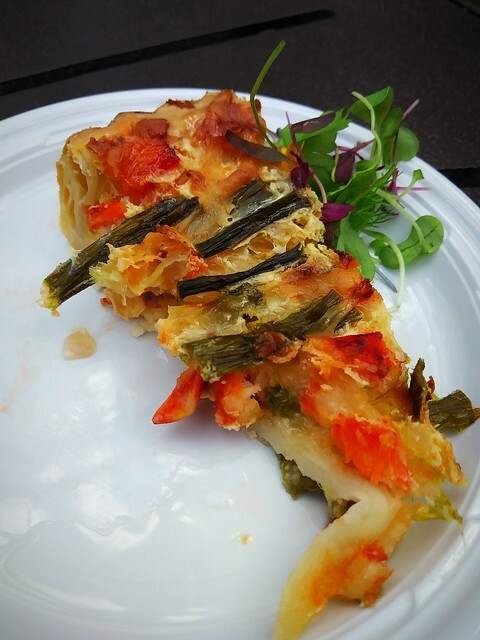 This was the Lobster Tarte from last year..it had asparagus in it instead of the leeks..the only thing I can remember about this from last year...which you can tell from the picture is that is was pretty dry and over cooked. 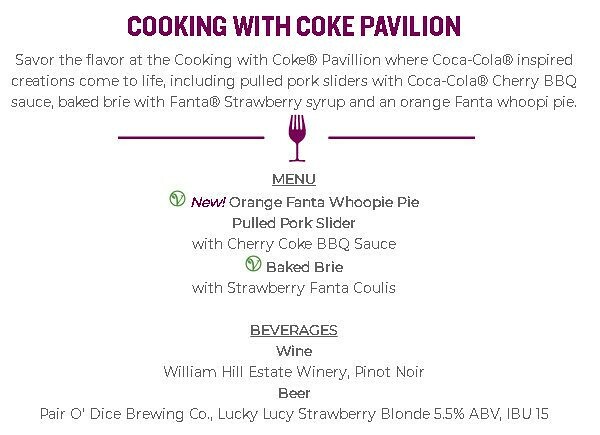 So, I'm curious about the Orange Fanta Whoopie Pie..I love me a Whoopie Pie..but I am curious how this will taste. The Baked Brie..again..I'm not the biggest brie fan so I didn't try it and probably wont again this year. 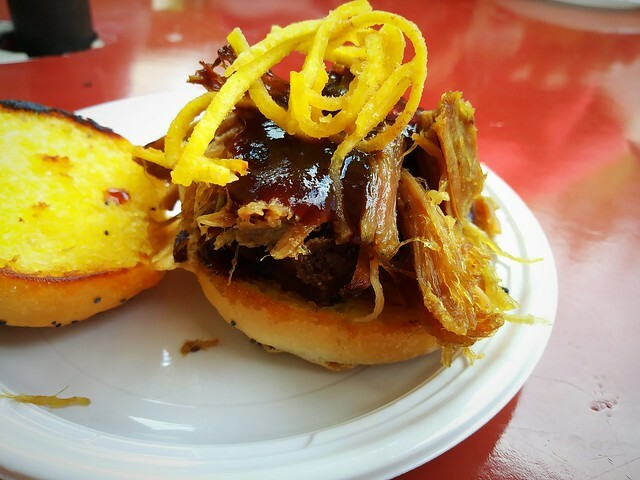 The Pulled Pork Slider was the bomb diggity last year! I didn't get the whole Cherry Coke BBQ sauce taste, but this did taste amazing! Definitely a must try! Look, for me I knew the Duck Fat Truffle Fries were going to be a fail for me from the start. I tasted them the first year they did Food and Wine at Busch Gardens and honestly, I just couldn't eat them. The taste of the truffle was too much for me. If you are a fan of truffles though, definitely get these! You can't go wrong with French Fries! They are so decadent though. 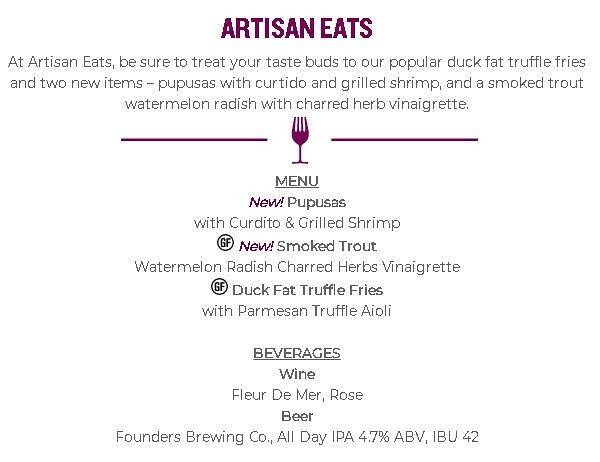 The Smoked Trout is new this year, so I am curious as to how it will look. I have no idea what a pupusas is, so to Google I went! It's a Salvadoran dish, so I am curious how it's going to come together with the Salvadoran Slaw and Shrimp. 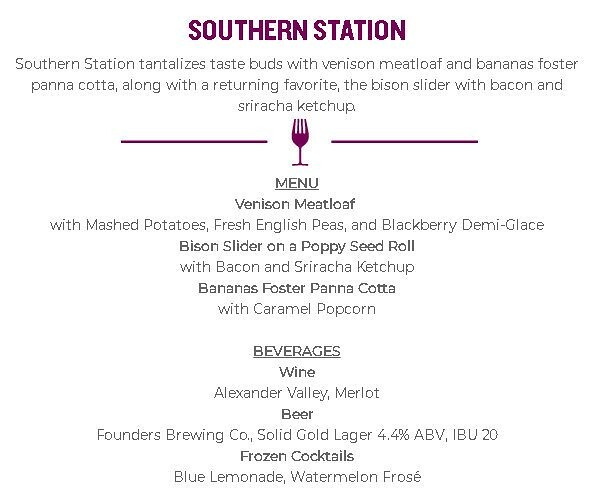 I'm curious as to how the Boiled Peanut Hummus is going to taste...I'm a hummus girl, so I'm curious how it will pair with a coke drizzle. Hm. The Minute Maid Apple Glazed Pork Belly sounds interesting..but I'm curious if it will be an actual Kimchee slaw..because Kimchi is fermented cabbage..soooo. Okay, I didn't eat the Coke Infused Cupcake because I didn't hear many good things about it. I honestly saw so many half eaten cup cakes lying around on tables where they were left so I skipped it...I'm hoping they use a different recipe this year. What is it with truffles? Maybe I am not posh enough to get it, ha! 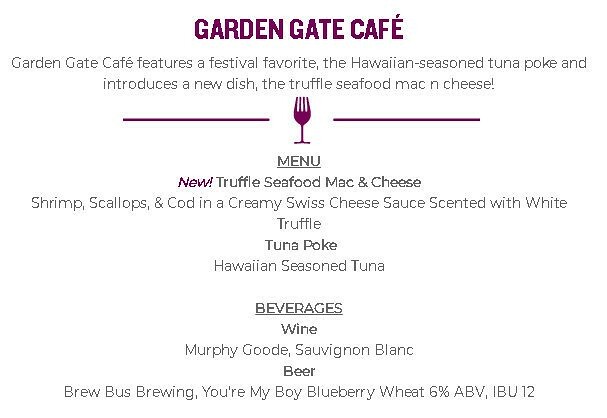 Anyways, the mac and cheese sounds good...for someone who likes seafood and truffles! 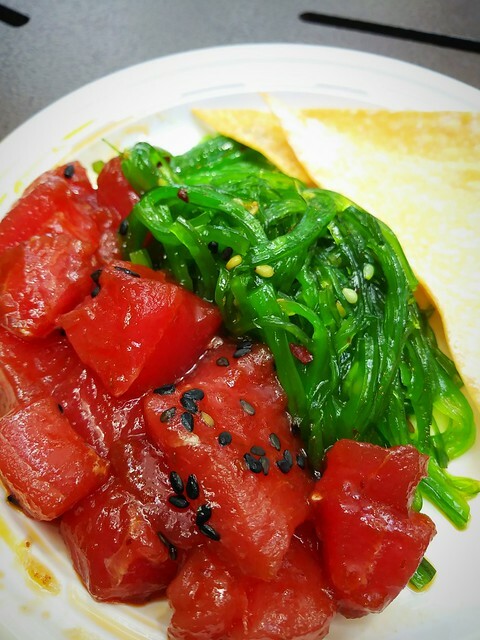 Here we have the Poke. My brother tried it and said that it was quite good. Ahh the Taco place. 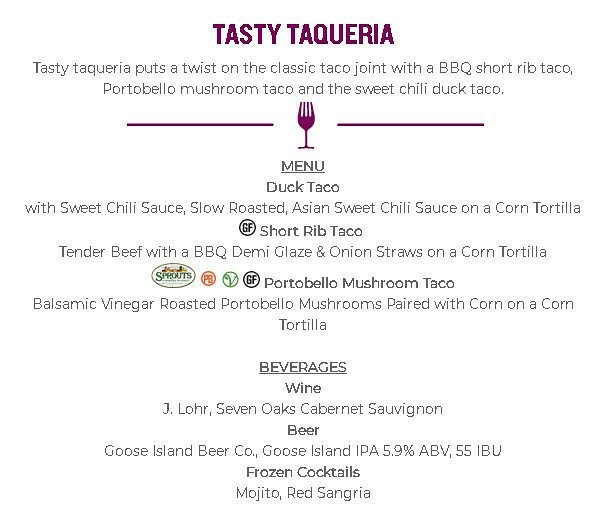 First, the Duck taco is good. I definitely recommend. 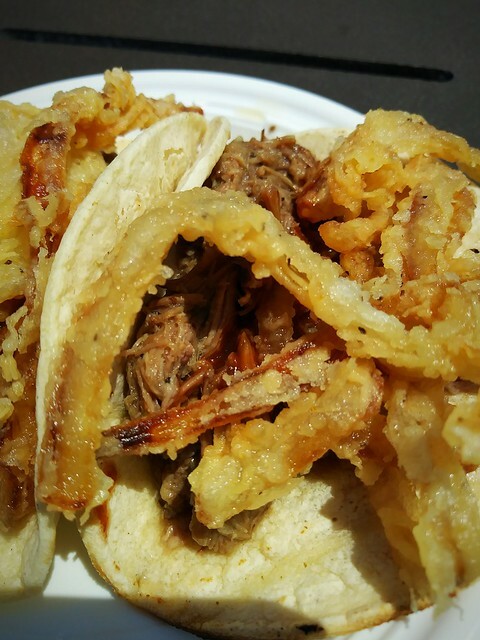 This is the pulled pork taco ^. Honestly, it didn't have much taste, so I am hoping they spice the heck out of it this year! I know they keep it in a liquid to keep the meat moist, but this turned into a hot wet mess. 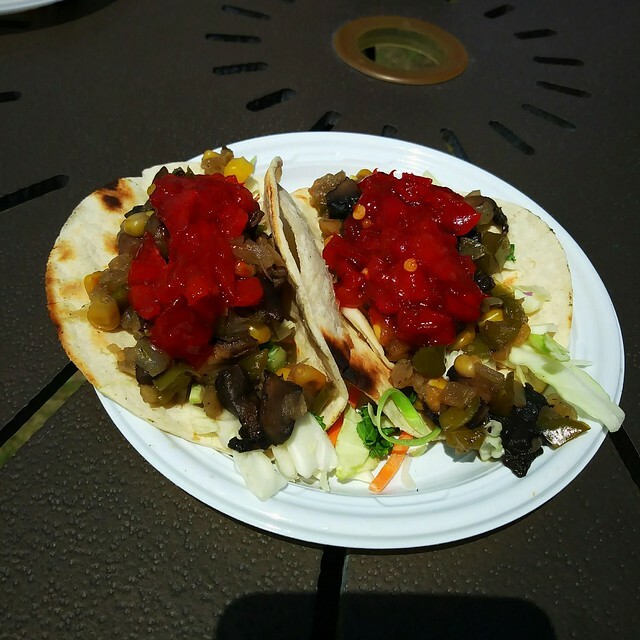 This hot mess is the portobello mushroom taco was...a mess. Do you see what it looked like? I had to take all of that red pepper mess off of it. Not even just that..this was so wet I ended up needing a fork to eat it. It was simply just too wet and had absolutely no taste..Well, let me rephrase, all you tasted was the red peppers that were slapped ontop. You didn't taste a single mushroom or anything else inside of the taco. Please please...make this better. 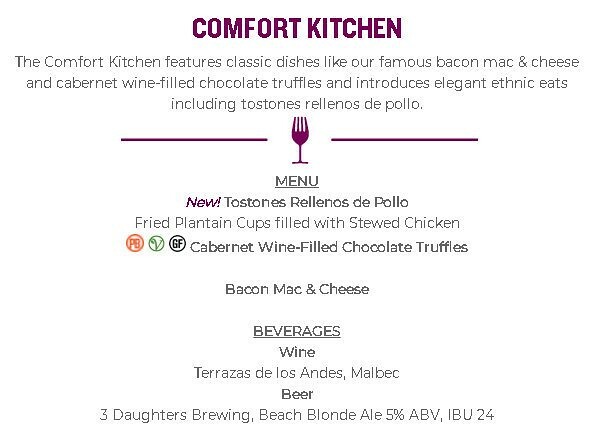 I'm interested in trying the Tostones Rellenos de pollo...it sounds so good! Lemme give you a warning about the bacon mac though..it's basically just the parks mac & cheese with bacon thrown ontop...unless they changed it this year. 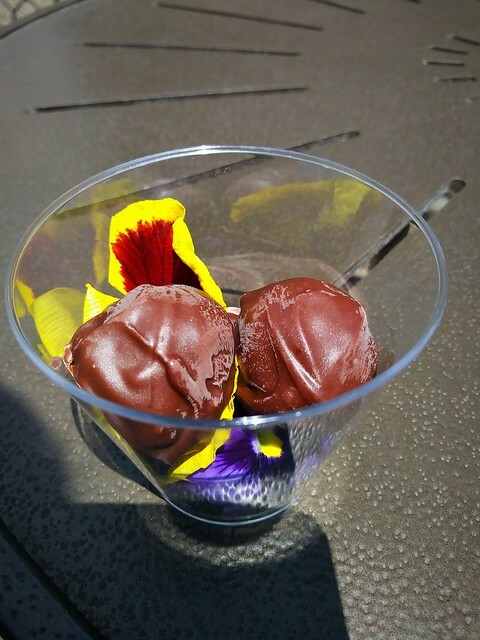 The Cabernet Wine-Filled Chocolate Truffle were so good! Heads up though, DO NOT BITE these..they are filled with LIQUID...just stick the entire thing in your mouth and bite it that way. Otherwise, you will get covered in wine. I obviously have a few favorites, a few misses, and a few new dishes that I want to try! 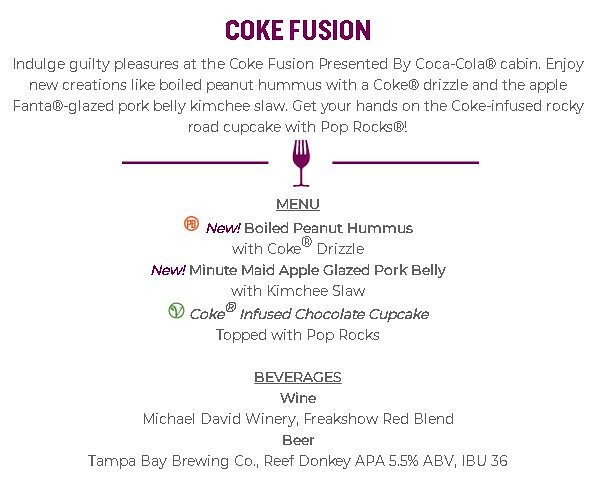 Have you been to Busch Gardens Food and Wine?! What are you interested in trying and is there anything you are probably gonna avoid?! I would love to know!